The travel industry is probably one of the most competitive industries in the world, this isn’t a secret. It’s also growing and worth billions globally, this again isn’t a secret. For hoteliers, resort operators, B&B owners, and hostels the online space is becoming more and more competitive with larger OTAs (online travel aggregators) dominating some parts of the market, and Google now entering the game as well with Google Hotels. That being said, SEO is still an important channel for your hotel website, and you can compete (on some fronts) with the larger OTAs and travel brands. In order to “do SEO”, you need to have some tools and data sources available to you, and when you’re not a multi-billion dollar hotel/resort enterprise with money to throw at marketing – it’s important that you spend what budget you do have wisely. Aside from free tools and resources in this guide, everything I’m going to show I’ve done using a tool called Mangools – which has a package starting at €25,90 a month (if billed annually – so €310 a year). With this tool you’ll be able to perform keyword research, look at search trends, and track keyword performance – on a scale that works for you, at a reasonable price. Typically when a user searches for a hotel, they search for [hotel + place name], as a result there is an element of “localisation” in Google’s search results. We know this from years of experience working with hotel/resort operators and booking sites from various parts of the world. This can often be referred to as “Venicing” or “Venice results”, after the algorithm (named Venice) which introduced more localised results for local intent queries. When performing keyword research for hotels and resorts, you may not always come across Venice keywords outside of popular locations using the majority of industry tools, as search volume is the average number of monthly searches in which a paid advert appears – and not everyone and everywhere runs PPC. 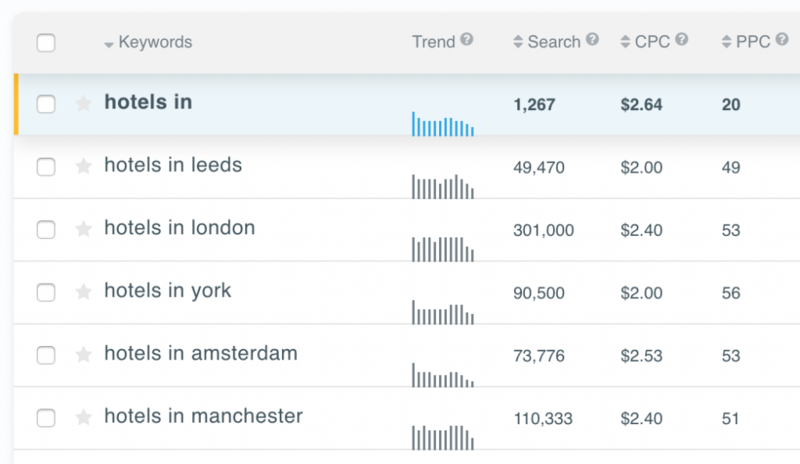 As you can imagine, search volume is also a good indication of competitiveness (as the market for hotels in London is bigger than that of Leeds, York, and Amsterdam combined – according to search volume data). Another important area to research is into what people are searching for in your town/city. Knowing this means you can produce a lot of highly relevant content to support your website’s commercial elements. This also gives your website the opportunity to appear for discovery based searches as people research their holiday ventures – and the more frequently your accommodation’s website and content appears at various stages of the sales funnel, the more likely it is that a user will recognise your expertise and build trust with the brand, and potentially lead to a conversion. You can use Mangools to extrapolate further questions that travellers are asking, and what information they’re looking for about your town/city. Once you’ve created a list of these research based travel queries, you can also view seasonal data, so you can more accurately forecast traffic expectancies for the content you produce. We’ve been able to view trends for keywords through Google Trends for some time now, but the ability to group keywords together in this way and view a “collective” trend around a top in this way is actually quite game changing. Making sure you own your Google My Business listing, as this is one of the most important elements for local search. You add your company’s opening hours, phone number, website URL, pictures, and any additional details you want to make easily accessible to guests. Probably the most important aspect of your Google My Business account is the ability for your guest reviews to appear directly in Maps or Search results. Having a Google My Business account makes your hotel website more easily accessible by appearing within Google Search listings. Potential guests can easily click “visit website” or “call” straight from Search. This increases the likelihood of these guests to not only view the reviews you’ve incorporated into your website, but also book directly with you instead of through an OTA. Another great thing about Google My Business, is the insights that it can give you into how people are discovering your brand online (outside of your website’s analytics and Search Console). 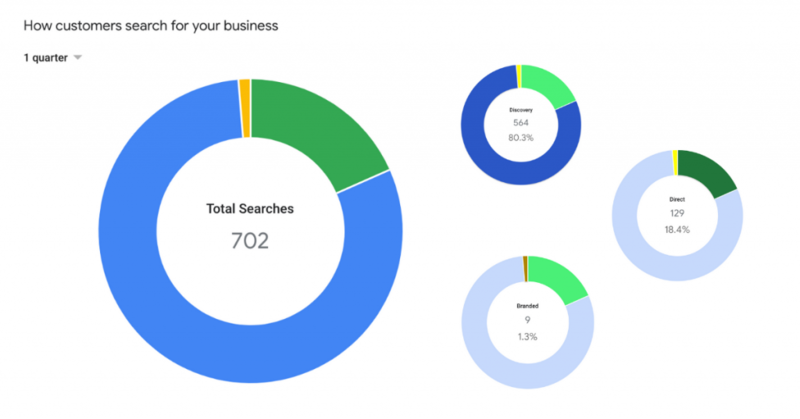 Google My Business gives great insights into how people are finding your business online, including a breakdown of the number of searches you’ve appeared for over a period of time, and a breakdown as to whether or not these searches were discovery, direct, or branded. You can also see data for the most popular queries for your accommodation (by unique users).